Home | Metal Prices | New Report: Monthly Metals Price Indexes Down — Why? New Report: Monthly Metals Price Indexes Down — Why? Manufacturing activity in the U.S. continues to be strong, as ISM’s PMI reported expansion in April for the 95th straight month. Economic growth in China is seemingly gangbusters — last quarter, the country’s annual GDP growth rate clocked in at 6.9%, its highest rate since Q3 2015. And, the U.S. dollar recently fell to a five-year low — the dollar usually experiences an inverse relationship with commodity prices, but has bucked that trend over the last month. But most industrial metal prices have fallen off — so what gives? 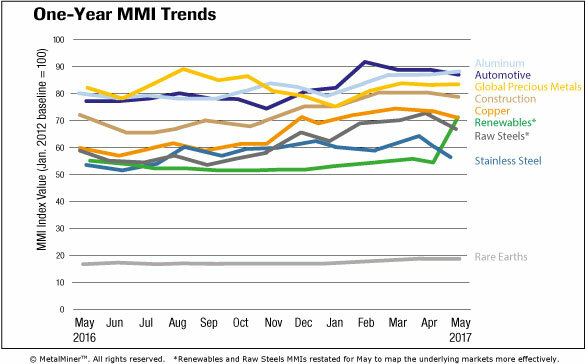 MetalMiner just released the May 2017 edition of our Monthly MMI Report, in which we analyze 10 baskets of metals by metal vertical and end-use industries — tracing a line through steel, grain-oriented electrical steel (GOES), stainless, base metals (aluminum, copper, nickel), and rare earths, to the automotive, renewables and construction sectors. Within the report, we give metal buyers more insight into what’s happening with these price trends, and what’s going on behind the scenes.